Many anonymous communication networks (ACNs) rely on routing traffic through a sequence of proxy nodes to obfuscate the originator of the traffic. Without an accountability mechanism, exit proxy nodes may become embroiled in a criminal investigation if originators commit criminal actions through the ACN. We present BackRef, a generic mechanism for ACNs that provides practical repudiation for the proxy nodes by tracing back the selected outbound traffic to the predecessor node (but not in the forward direction) through a cryptographically verifiable chain. It also provides an option for full (or partial) traceability back to the entry node or even to the corresponding originator when all intermediate nodes are cooperating. Moreover, to maintain a good balance between anonymity and accountability, the protocol incorporates whitelist directories at exit proxy nodes. BackRef offers improved deployability over the related work, and introduces a novel concept of pseudonymous signatures that may be of independent interest. We exemplify the utility of BackRef by integrating it into the onion routing (OR) protocol, and examine its deployability by considering several system-level aspects. 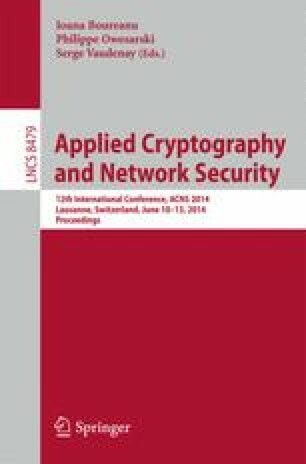 We also present the security definitions for the BackRef system (namely, anonymity, backward traceability, no forward traceability, and no false accusation) and conduct a formal security analysis of the OR protocol with BackRef using ProVerif, an automated cryptographic protocol verifier, establishing the aforementioned security properties against a strong adversarial model.